The decision by Sudan to expel or close down 16 relief organisations may trigger a severe humanitarian crisis in the war-ravaged western Darfur region, aid workers warned. Halting their operations would leave 1.1 million people without food, 1.5 million without healthcare and at least one million without drinking water, according to the UN, which describes the groups as "integral" to the world’s biggest humanitarian operation. "If the life-saving assistance these agencies were providing is not restored shortly, it will have immediate, lasting and profound impacts on the wellbeing of millions of Sudanese citizens," the UN warned in a statement. "It is not possible, in any reasonable timeframe, to replace the capacity and expertise these agencies have provided over an extended period of time." Khartoum expelled 13 international NGOs and closed three Sudanese relief organizations after the International Criminal Court (ICC) issued an arrest warrant for President Omar el-Bashir on war crimes charges on 4 March. Bashir denies all the charges. Speaking at a rally in the North Darfur state capital El-Fasher on 8 March, he promised Sudan would cover the work of the expelled agencies. "We will fill the gap left by the NGOs," he said, without going into detail. The Sudan Media Centre, a website close to government officials, said Khartoum was preparing an "alternative plan" to fill the gap, collaborating instead with "national and friendly foreign" NGOs. "What had been provided by those organisations to people in Darfur could simply be provided by national organisations," government spokesman Kamal Ibaid was quoted as saying. So far, the National Health Corporation has said it will send 100 medics and 100T of medicines to camps for internally displaced persons (IDPs) in Darfur "to bridge any medical gap there". Mahdi Qutbi, a senior member of the ruling National Congress Party (NCP), said more than 200 Sudanese organisations would fill the void, with some taking over the offices of expelled agencies, according to a report on the Sudan Tribune website. He listed several Sudanese or Islamic relief agencies, including the Sudanese Red Crescent Society, that would now provide food, healthcare and water, the report added. 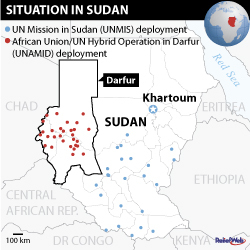 Analysts, however, warned Sudan would find it hard to bridge the gap in an aid operation costing more than US$2 billion annually. In El-Fasher, Bashir threatened other NGOs, diplomats and even peacekeepers with expulsion if they did not follow Sudan’s laws. "The situation is far worse than we imagined," said one international aid worker, requesting anonymity. "We feared restrictions … but not this – not that all the biggest [agencies] should go at once." "Morale is very low: we suddenly we have lost dozens of colleagues overnight - people who were both friends and people we relied on in our work too," said another. "More than that, however, many of the communities they served have lost their one focus of hope." IDPs in the sprawling Kalma camp in South Darfur expressed similar fears. "Without food or good water, what have we to stay in the camp for?" asked one resident in the camp of 89,000 people. Oxfam GB, which provided potable water for the camp, and Médecins sans Frontières, which provided healthcare, were among those asked to leave. A meningitis outbreak was reported in Kalma camp last week. "Without partners, the Ministry of Health and WHO [World Health Organization] will be hard-pressed to deliver the necessary vaccinations and treatment to arrest the spread of this highly contagious disease," warned Catherine Bragg, UN Assistant-Secretary-General for Humanitarian Affairs. "Tension and anxiety in IDP camps could erupt if life-sustaining services are indeed cut off," added Bragg. "Rebel movements, reacting to the impact on the population, could also take hostile action." Last month, the government signed a deal with Darfur’s strongest rebel group, the Justice and Equality Movement. Since the warrant, the rebels have reneged on the deal. Several factions from the splintered rebel Sudan Liberation Army have also criticised the expulsion of aid agencies. The UN Refugee Agency (UNHCR) said it was deeply concerned that aid restrictions could cause new movements of people, putting extra pressure on areas already stretched to their limit. "With some 4.7 million Sudanese – including 2.7 million internally displaced – already receiving assistance in Darfur, we are very concerned over the prospect of new population movements in the region should the fragile aid lifeline inside Sudan be disrupted," it said. L’expulsion de 13 organisations humanitaires du Soudan met en péril plusieurs centaines de milliers de civils les plus vulnérables, ont averti des groupes d’aide humanitaire, en exhortant le gouvernement à réexaminer sa décision.